On the go? Download here. Our weekly conversations invite you to play within the questions of life. In a way, we’re walking each other home to our most authentic selves. Topics inspire change, spiritual growth and clarity. Phoebe works with her gift of clairvoyance to help others shift perspectives, be empowered and more aligned to their truth. Eleni works between worlds weaving together shamanism, the dreamworld and creativity. They invite you to experience this podcast as an energetic portal opening to a world of discovery and clarity. If you’re ready to go deep, to spaces and places between worlds, to shed old stories so you can remember who you are, to explore life with curiosity and lightness, then you’re in the right place. We'd love you to connect and share the unveiling of our podcast on Instagram or to subscribe to our show. We’d be thrilled to hear from you. 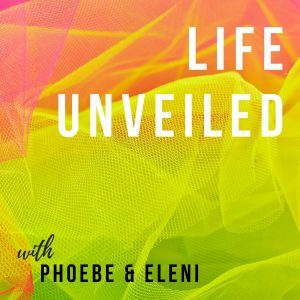 Remember to tune in every Wednesday to catch another episode of Life Unveiled.